The public Swiss Family Fraunfelder could not have functioned without the private family. 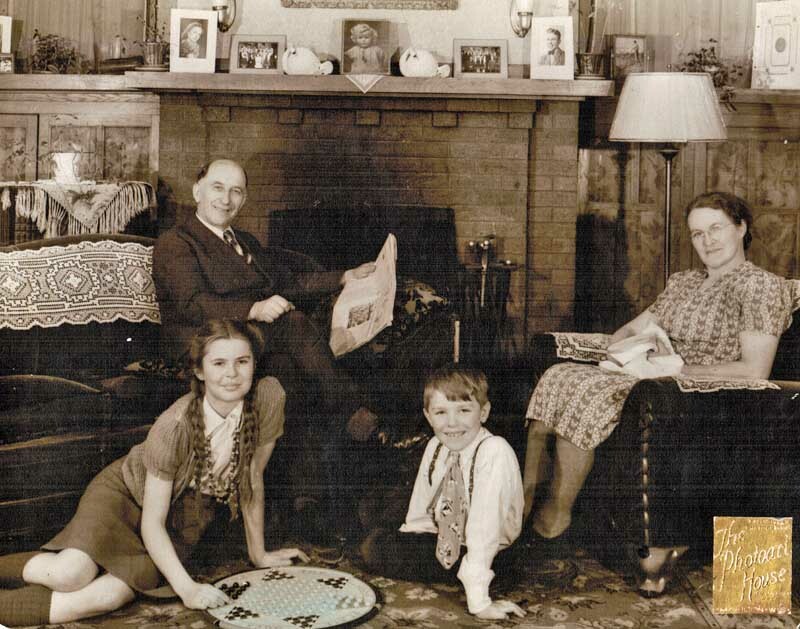 And the private family flourished because of Frieda Fraunfelder, the wife of Papa and the mother of Rheiny, Betty, Ruthie, Hansi, Helen, and Fritz. Mama was viewed by many as the most remarkable member of the Swiss Family Fraunfelder. Her life spanned nearly 101 years (all of the last 67 years in the United States.) Her legacy endures today. She had a profound impact -- not only her children -- but more than 21 grandchildren,16 great grandchildren who knew her, and many friends of the family. The 70-year marriage of Papa and Frieda started on strange circumstances in Switzerland. Son Fritz recently wrote, “My father was to marry her younger sister who died of tuberculosis. On her death bed she made my father promise to marry ...the older sister." Frieda, whose maiden name was Fehlmann, came from a prosperous farming family that may have also had banking interests. Her parents were Samuel Fehlmann of Moriken, Switzerland, and Lisette Seeberger, of Birr, Switzerland. 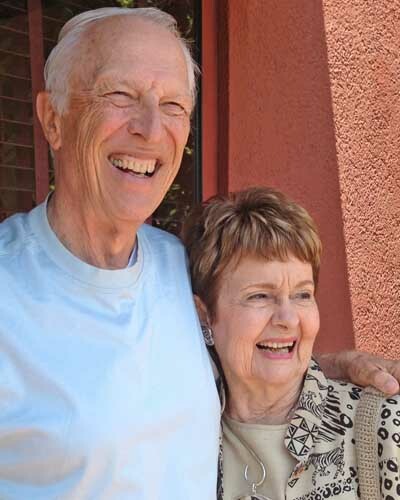 Samuel Fehlmann was described as a wise, kind and generous man who helped his neighbors. Frieda received a significant inheritance from her parents. But her younger brother, who was an investor, lost it all in the stock market crash of the Great Depression, according to Fritz. tons of vegetables from the family garden and knitted a mile a minute ....socks, sweaters, scraps, etc. which she also gave away." Each family in the extended Fraunfelder clan posessed handmadeafghans, blankets, sweaters, socks and other intricately made gifts from Mama. She knitted more than 150 afghans during her later years.She had really few moments only to herself and long periods alone with the three younger children at home while the three older children and Dad went on concert tours. She was an exceptional hostess and Betty Ganders often said that it is a shame her mother never had the opportunity to open her own tea room, pastry shop, or konditorei, as it would have been a great success. Even impromptu visits at the Fraunfelder home by family or friends were met with a tray of homemade treats by "Mama" and a glass of loganberry juice, lemonade, or tea. There were generous and somewhat impromptu invitations for lunch or dinner (which were both very heavy meals for guests.) A typical menu might be Swiss veal bockwurst, sauerkraut, green beans with onion and bacon, and a Swiss potato dish called “Rösti.” Right is a photo of Rösti; a Swiss national dish with the primary ingredients potato, Maggi, onions and bacon. The Thanksgiving 2011 edition of Rösti is displayed in the photo by Tiffany Lundy, daughter of Larry and Robin Ganders. Mama Fraunfelder was also noted for her handmade egg spätzle or rice. This wasn’t diet food and she often offered to pour butter warmed in a cast iron skillet over your entire dinner. Most dishes were seasoned with Maggi, a seasoning sauce first introduced by the Swiss in 1886 and made today by Nestle. Fruit pies, often baked with an egg custard, or traditional Swiss cookies like a raspberry bar or German sour cream twists, were quite common desserts by Mama Fraunfelder. 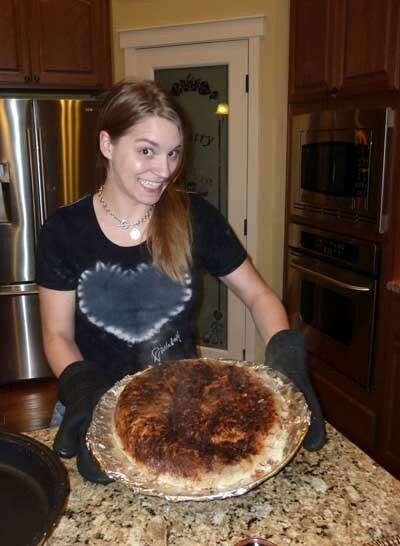 Her pies and preserves were often filled with Oregon berries that she picked herself. Some of the grandchildren recall her orange marmelade. 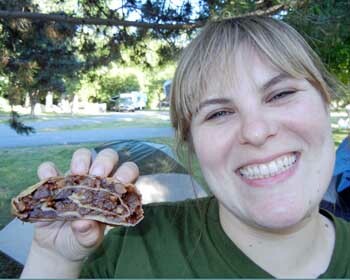 One of her specialities was homemade braetzli, a wafer-thin almond-vanilla cookie heated and pressed between metal plates with a special Swiss iron. Another was "springerle" cookie, a hard block cookie flavored with anise seed that is aged for months that was dipped into hot chocolate, tea, or coffee. 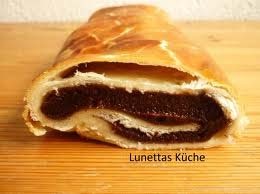 Another Swiss specialty was a pastry with a black dried pear filling called, "birewegge." Above and to the right are photos of different versions. Breakfast featured a Swiss dish called "fotzel schnnitte," a french toast covered with sugar and cinnamin, topped with anapple compote. At the age of 95, she still cooked such complete meals and treats for relatives and friends in her Woodburn, Ore. home. And they still tasted very good. 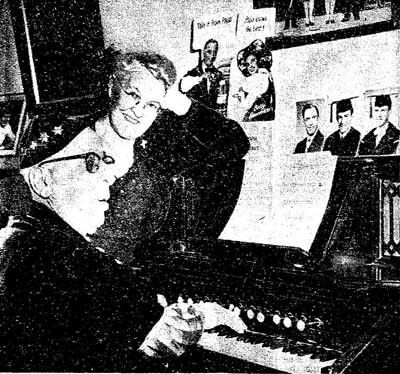 “She was a very devoted Christian who seldom went to church but listened to the Lutheran Hour every Sunday morning on the radio,” Fritz said. “Dad would not let her get American citizenship nor a drivers license for reasons I do not know,” Fritz said. Mama would almost always greet grandchildren with the Swiss expression that they are "harzig" or cute. This is an example of sometimes substantial differences between the many Swiss German dialects and the language spoken in Germany. The German word for cute is "niedlich." Instead of "guten tag," the Swiss say, "gruezi." Many words in the dialect can not be accurately written. Like many Swiss Germans, she laughed at the language's word for "kitchen cupboard." The word is "chuchichaschtli." When pronounced correctly, the word sounds like a cat coughing up a hairball. Bedtime for grandchildren was often preceded by servings of hot water and honey (heise honig wasser.) 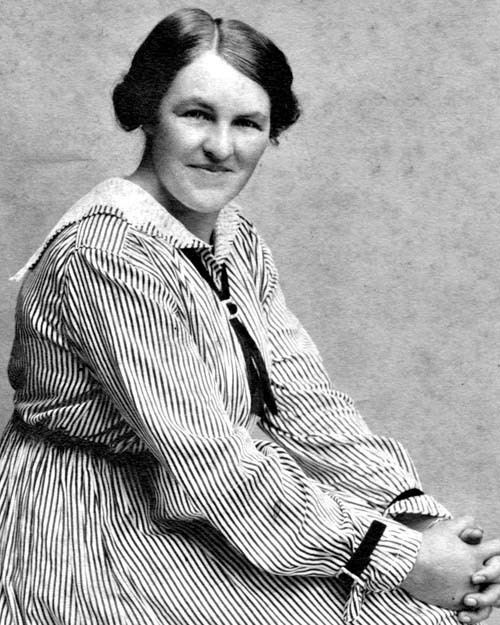 Frieda would sing a version of a traditional Swiss lullaby to her children and granchildren in Schyzerdutsch. The song title is "I ghore es Gloggli." It was a song that told of the ringing of bells and ended with "Amen" three times. Many of her great grandchildren still sing the song as it has been passed down for generations. Unfortunately, they do not posess the English translation. Left, a photo of Mama (Frieda Fehlmann), perhaps taken well before she was married in 1918. Center, is the Fehlmann Family Farm Home; Moriken-Wildegg,Switzerland. 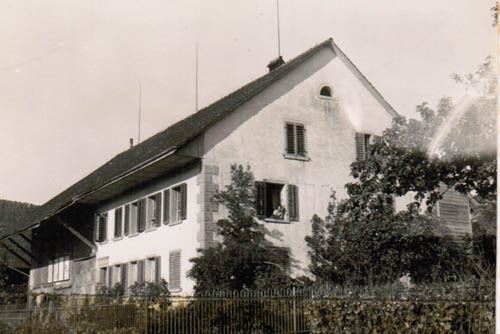 This is the original childhood Swiss home of Mama Fraunfelder that still stands today although it is scheduled for demolition in 2017 for new housing. But at least one historic stone wall must be retained by the new developers, according to Philippe Fehlmann, a Swiss grandson of Mama's brother, Samuel. He said the wall was built with stones from Wildegg Castle, a nearby 13th Century Habsburgh castle and Swiss law requires the wall to be preserved. The wall separated an animal stable from the living area in the 5,000-square-foot Fehlmann House. A descendant of the Fehlmann family still has an apartment in the house. The main entrance was built in 1885 (and so marked) but the building may be much older, perhaps circa-18th Century. Right, the May 9, 2013 reunion of two cousins after many decades: Fritz Fraunfelder, the son of Papa and Mama Fraunfelder, and Rosemarie Fehlmann Kaston, the daughter of Mama Fraunfelder's brother, Oscar Fehlmann. Mama Fraunfelder's Swiss Home in Moriken-Wildegg has been sold and will be replaced next year by a new apartment complex . Above, an article from the Keizer, Times, Keizer, Ore., 1989.